ELENA OF AVALOR. (Disney Channel). Disney is crowning a new princess. The House of Mouse announces its new Elena of Avalor TV series, coming to Disney Junior in the US and Disney Channel, globally. After Her Royal Highness debuts on television worldwide, Princess Elena of Avalor will be appearing at Walt Disney World Resort this summer and at Disneyland Resort in the fall. 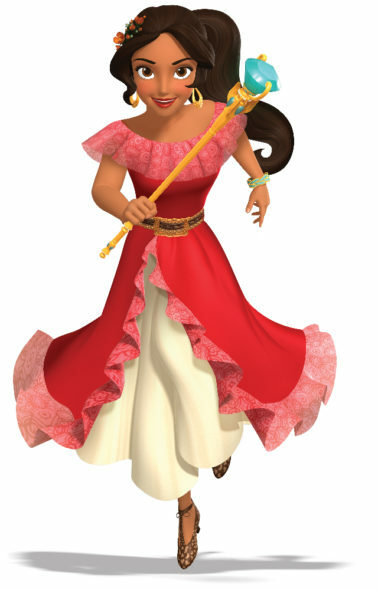 Elena of Avalor is described as a confident and compassionate teenager. Her enchanted fairytale kingdom is said to be inspired by “diverse Latin cultures and folklore.” Elena will spin off from a special episode of Disney Junior’s Sofia the First TV series, beginning production now for a 2016 premiere. Aimee Carrero of Freeform‘s Young & Hungry is voicing Princess Elena. Princess Elena of Avalor, a confident and compassionate teenager in an enchanted fairytale kingdom inspired by diverse Latin cultures and folklore, will be introduced in a special episode of Disney Junior’s hit series “Sofia the First” beginning production now for a 2016 premiere. That exciting story arc will usher in the 2016 launch of the animated series “Elena of Avalor,” a production of Disney Television Animation. The announcement was made today by Nancy Kanter, Executive Vice President and General Manager, Disney Junior Worldwide. The role of 16-year-old Princess Elena, the bold, caring, funny and clever ascendant to the throne in the fairytale kingdom of Avalor, will be voiced by Aimee Carrero (ABC Family’s “Young & Hungry”). As with all Disney Junior programming, “Elena of Avalor” stories will be guided by an established curriculum that nurtures multiple areas of child development: physical, emotional, social and cognitive; thinking and creative skills, as well as moral and ethical development. Created for kids age 2-7 and their families, the stories are designed to communicate positive messages and life lessons that are applicable to young children about leadership, resilience, diversity, compassion and the importance of family and family traditions. “Elena of Avalor” is executive-produced by Craig Gerber (of the Emmy Award-nominated “Sofia the First”). Silvia Cardenas Olivas (“Moesha,” “The Brothers Garcia”), an alumna of the National Hispanic Media Coalition’s Television Writers Program, is the story editor, and Elliot M. Bour (“The Little Engine That Could”) is the supervising director. The series’ cultural advisors are Doris Sommer, Harvard University professor and Director of Graduate Studies in Spanish; and Marcela Davison Aviles, Managing Director and Executive Producer, El Camino Project, an international Latino arts initiative. The series is a spin-off of “Sofia the First,” which has delivered the two highest-rated telecasts in cable TV history among Kids 2-5 and Girls 2-5, and the #2 preschooler cable TV telecast ever in Total Viewers, Adults 18-40 and Women 18-49. Disney Junior reflects the emotional connection generations of consumers have to Disney storytelling and Disney characters, both classic and contemporary. It invites mom and dad to join their child in the Disney experience of magical, musical and heartfelt stories and characters while incorporating specific learning and development themes designed for kids age 2-7. Disney Junior’s series blend Disney’s unparalleled storytelling and characters kids love deeply with learning, including early math, language skills, healthy eating and lifestyles, and social skills. In the U.S., Disney Junior is a daily programming block on Disney Channel and a 24-hour channel. There are 34 Disney Junior channels in 25 languages around the world. What do you think? How do you like the sound of the animated Elena of Avalor TV show? Is there a little princess in your life, who can identify with this new Disney character? More about: Disney Channel TV shows: canceled or renewed?, Disney Junior TV shows: canceled or renewed?, Elena of Avalor, Elena of Avalor: canceled or renewed?, Sofia the First, Sofia the First: canceled or renewed?